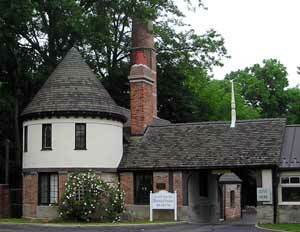 Where in the Cleveland area would you find this Historical Monument to William E. Telling? 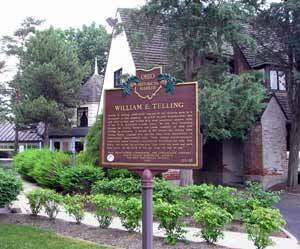 (from the plaque): William E. Telling was one of ten children born in a farmhouse on this property. 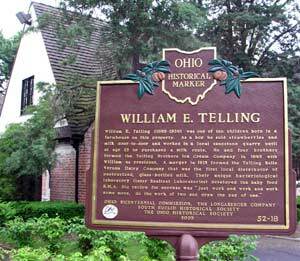 As a boy he sold strawberries and milk door-to-door and worked in a local sandstone quarry until at age 23 he purchased a milk route.He and four brothers formed the Telliing Brothers Ice Cream Company in 1895 with William as president. A merger in 1915 formed the Telling Belle Vernon Dairy Company that was the first local distributor of pasteurized, glass-bottled milk. Their unique bacteriological laboratory (later Sealtest laboratories) developed the baby food S.M.A. His recipe for success was "just work and work and work some more. Do the work of two and draw the pay of one." The Ohio Historical marker is located on the grounds of the South Euclid-Lyndhurst Library on Mayfield Road. Copyright © 2001-2006 ClevelandSeniors.Com. All Rights Reserved.